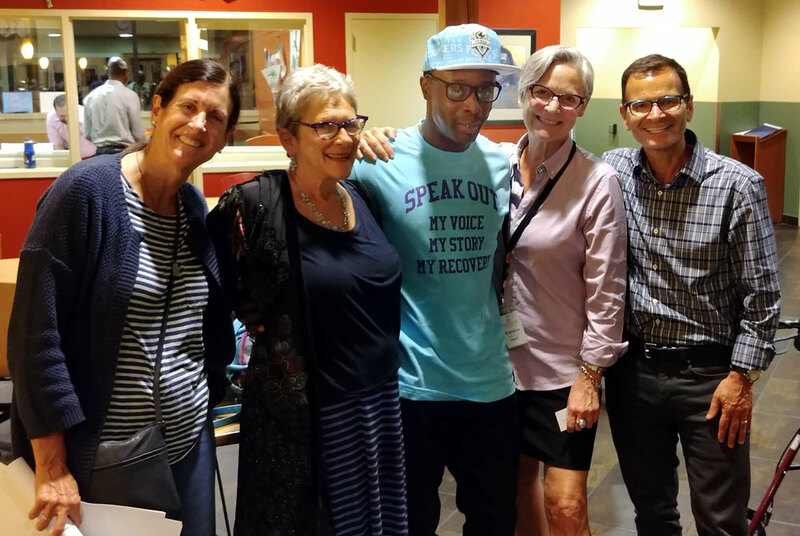 Recovery Café’s Speak Out for Recovery Event which featured Grammy award winner Michael Wansley – the Wanz of Thrift Shop fame – was an incredible night of shared hope, triumph and the joy that Recovery Happens! There were several highlights of the night including the presention of King County’s two Recovery Month Art Awards by Jim Vollendroff, the Director of King Countys Behavioral Health and Recovery Division. The first award was for the Recovery Poster which was created by Recovery Café’s Vivian Linder Levy (please see her letter in this newsletter) and Recovery Café Member Chris Curry winning the Poetry Award. Chris presented a framed copy of his poem to his Case Manager Sharon Mayo from Community Psychiatric Clinic. It was a profoundly moving moment. Pictured is our Board Chair, Dr. Victoria Allen, Sharon, Chris, our Community Engagement Manager, Carolyn Dougherty and Jim Vollendroff. These celebrations of recovery and victories of hope, healing and transformation would not be possible without the generous support of our donors and we are grateful! Thank you for helping us make the world a better place.